Of the 16 million Americans who served their country during World War II, fewer than 900,000 still survive. Martin Olsen is one of the survivors, and he has a story to tell. It blends the history of a generation that was born during the Great Depression, fought and won a world war, and went on to rebuild a society that launched new industries and sent men to the moon. Martin Olsen considers himself a lucky man-an amateur soldier who fought in the European theater and became part of the Great Generation. 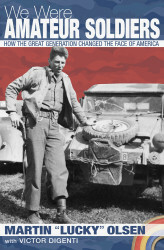 This is more than another WW II memoir. We Were Amateur Soldiers shows us a man who, through his faith, self-confidence, and force of will, emerged from the horrors of war to grow his father’s small business into a market leader. Though it’s Marty’s life, it’s also America’s story.